Let's Stamp! : Reading Training - thanks girls! One of the things I love about Stampin' Up! (other than all of the gorgeous products of course!) is the support that you get from SU! I spent Saturday in Reading for a training day and it was such good fun! We had lots of sneak peaks of the new products that are going to be in the new mini catalogue (come back on the 1st April for more details) and it was a great chance to meet up with fellow demonstrators. I was a tad nervous as I'd not met any demos yet, but I needn't have been. The top photo shows me with the other Emma H (!) 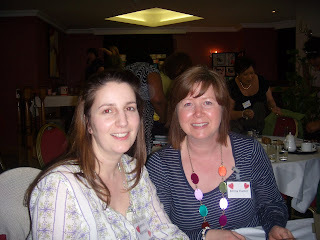 and fellow Stampin Star. It was great to meet someone else in our group, even if our upline Natalie wasn't able to make the training event. I really shoudn't let the camera anywhere near me though! 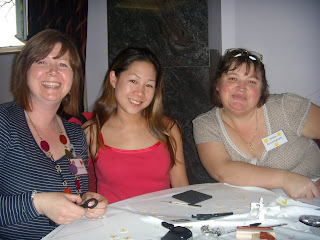 And here are some of the other lovely girls at our table busy making our challenge project (Emma, Alex and Jackie). I can't show you what we made just yet but all will be revealed on the 1st April! Big hellos also to Nickie, Carol and Sue who were also on our table but I got distracted and neglected to take their photo, sorry! I received some amazing swaps and was blown away by some of the demonstrator's choices projects - in fact, make that all of them! Again, more pics to come soon! Huge thanks to all of the presenters who showed us some wonderful projects and made it such a fantastic day. If you're interested in becoming a demonstrator or want to come to my Open House for the mini catalogue launch then please send me an email.